DFW Urban League Young Professionals - Human Capital: Invest in You! Human Capital: Invest in You! By purchasing this ticket you acknowledge you are a current college student and able to provide a current college student photo ID during onsite registration. Failure to provide a current college student photo ID will prevent entry into the conference. No exceptions to this clause will be considered. Additionally, no refunds will be made for this ticket purchase. If you have any questions prior to purchase, please email membership@dfwulyp.org. As leaders, we work hard, give back and balance competing interests. Students, entrepreneurs, community influencers, corporate professionals... 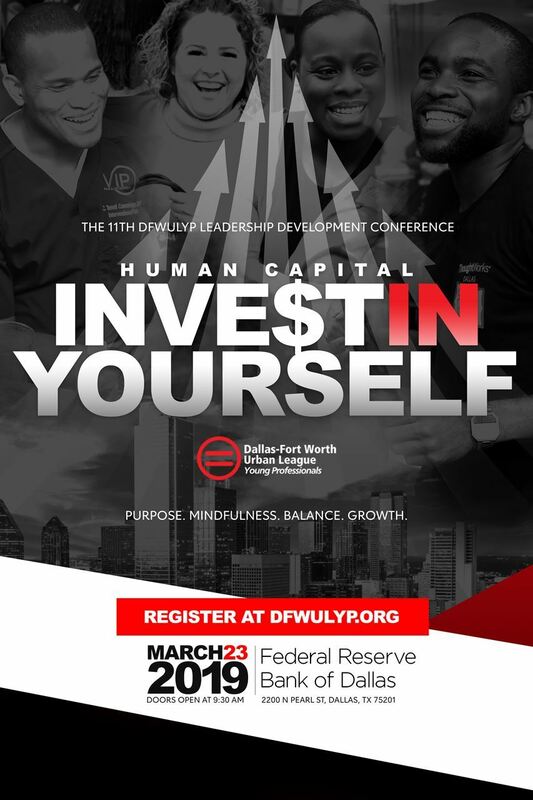 If you're seeking clarity about your purpose, to refine your personal brand, or understand how mindfulness can elevate your performance and well-being, the 11th DFWULYP Leadership Development Conference is the place to grow. Our theme is Human Capital: Invest in Yourself. You are what makes our communities and families vibrant, powerful and successful. Instead of compartmentalizing our priorities, we are focusing on integrating our personal and professional goals. It is time to dig deep, learn in interactive sessions, and apply this knowledge with actionable game plans. Join us at the Federal Reserve Bank of Dallas at 10 A.M. on March 23, 2019 to take your personal and professional success plan to the next level.